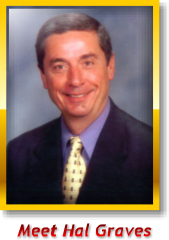 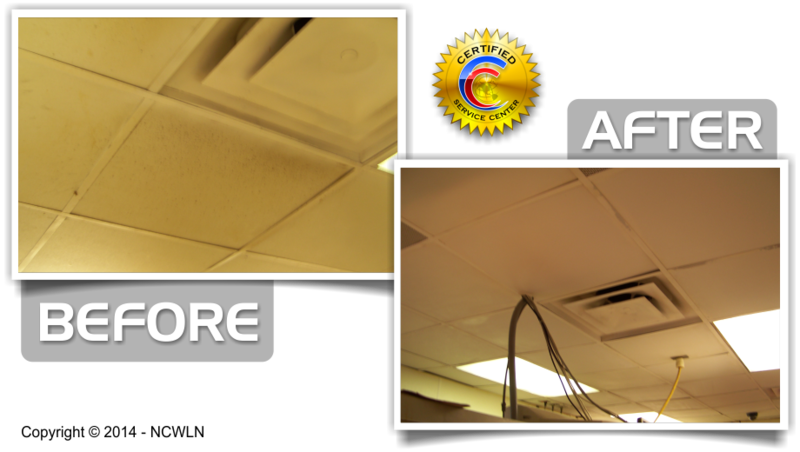 Since 1987, Caruso Care, Inc.'s, National Ceiling, Wall & Lighting Network has specializing in ACOUSTICAL CEILING CLEANING & RESTORATION, EXPOSED OVERHEAD STRUCTURE CLEANING, WALLS, LIGHTING MAINTENANCE SERVICES and other SPECIALTY CLEANING SERVICES accumulating years of experience and knowledge supplying our services to Top Retailers and Fortune 500 customers provides us and our Service Centers expertise not available elsewhere. 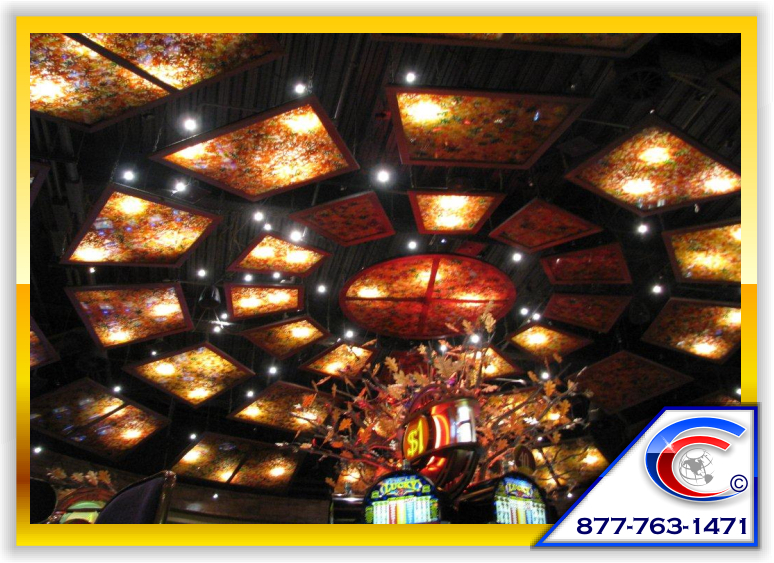 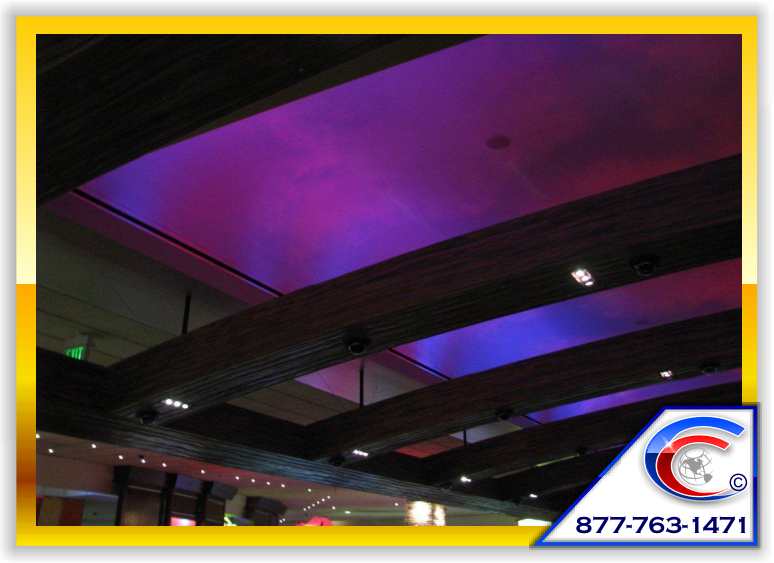 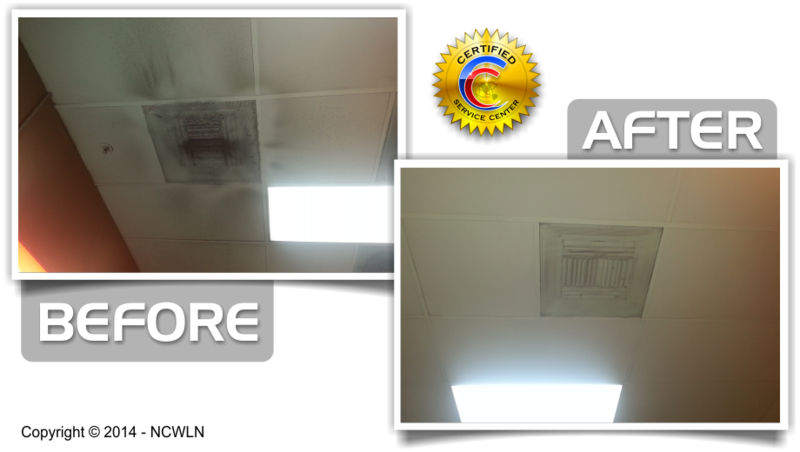 Let our National Ceiling Cleaning and Lighting Maintenance Services Company handle your next project. 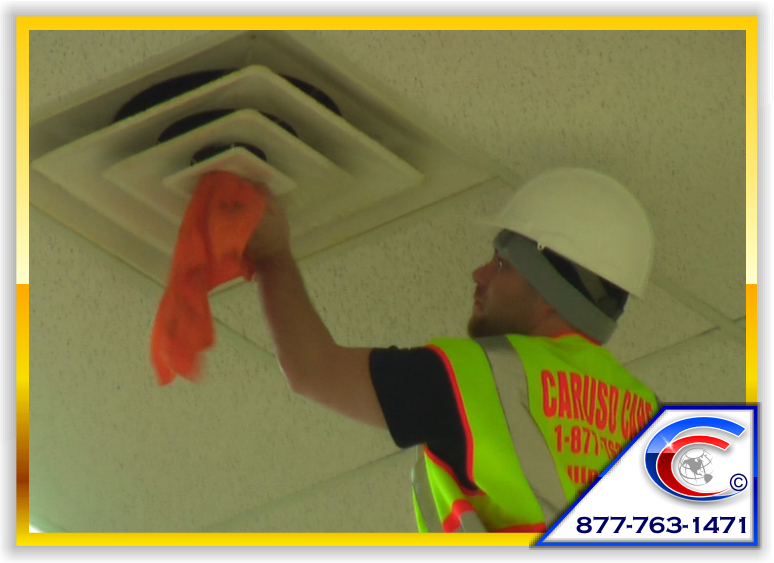 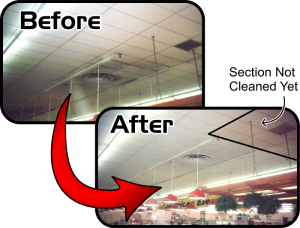 Why our Ceiling Cleaning Network? 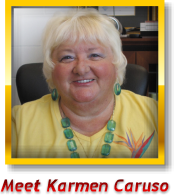 Interviews in Trade Publication Magazine! 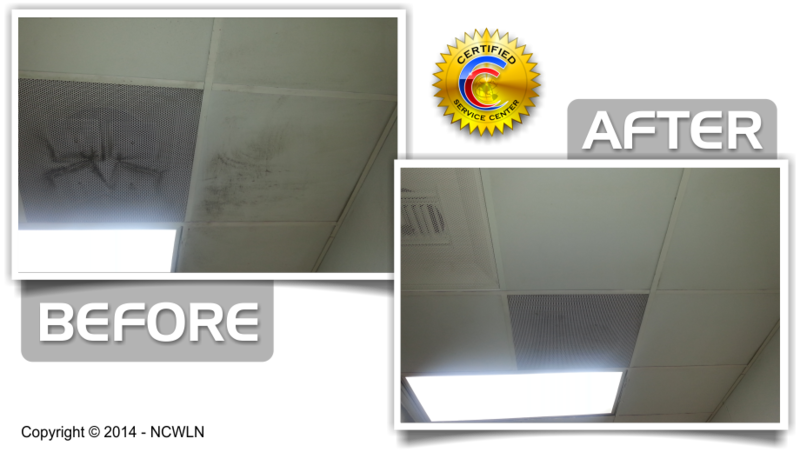 Foremost Ceiling Cleaning Industry Expert! 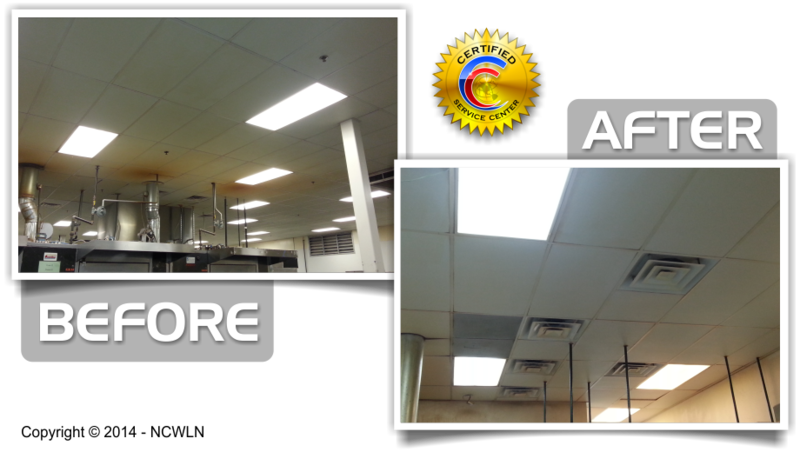 Explore our website and discover how we can save your company time and money, while improving the overall appearance of your location. 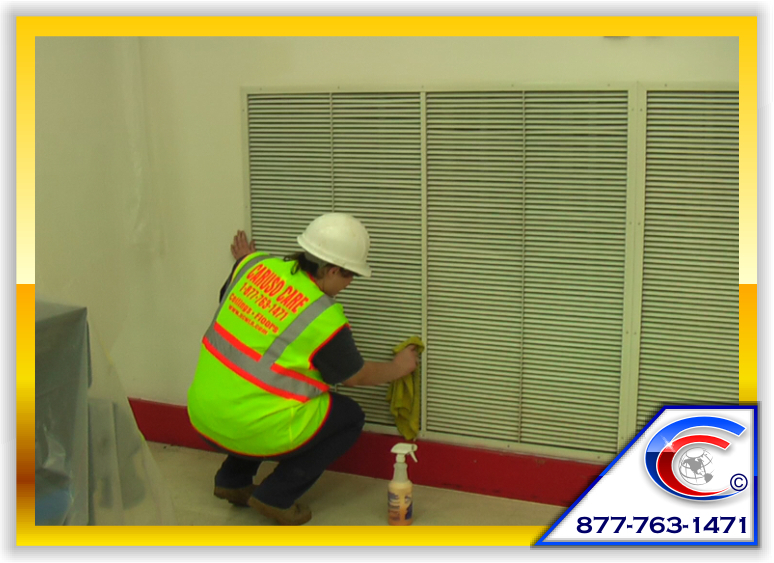 Making your facility clean, bright and healthier will also improve employee productivity and customer's attitudes. 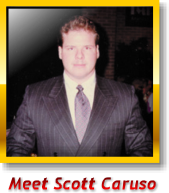 "Click ON" the Services Links below to Learn More. 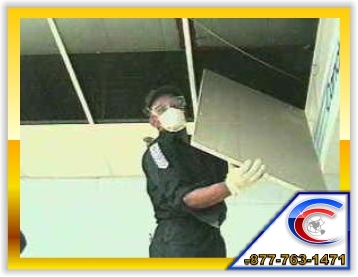 It's a Fact! 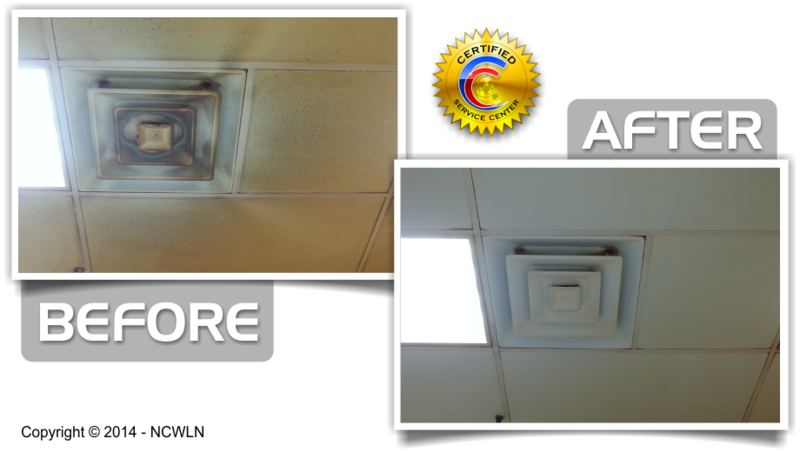 And we can prove it. 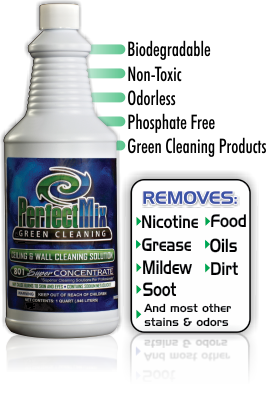 “How does the process work when cleaning the acoustical ceiling"
Our Perfect Mix ™ Environmentally Green Cleaning Products and Systems are used by Network Professionals and Designed by Cleaning Experts. 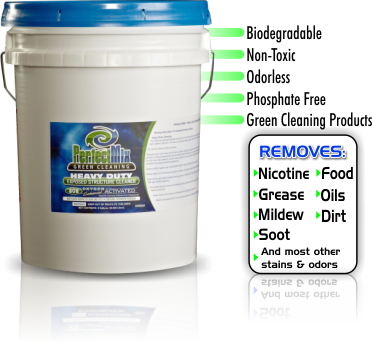 Our products and services deliver better cleaning while being environmentally sound. 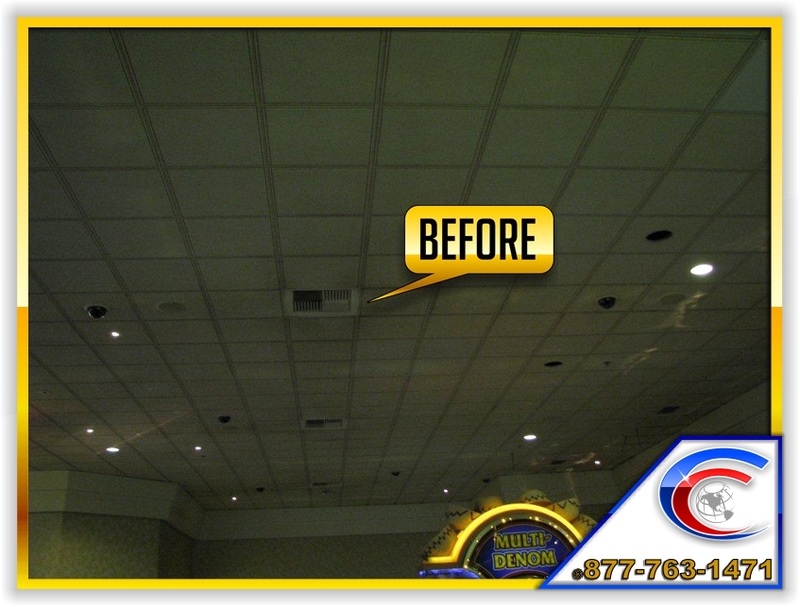 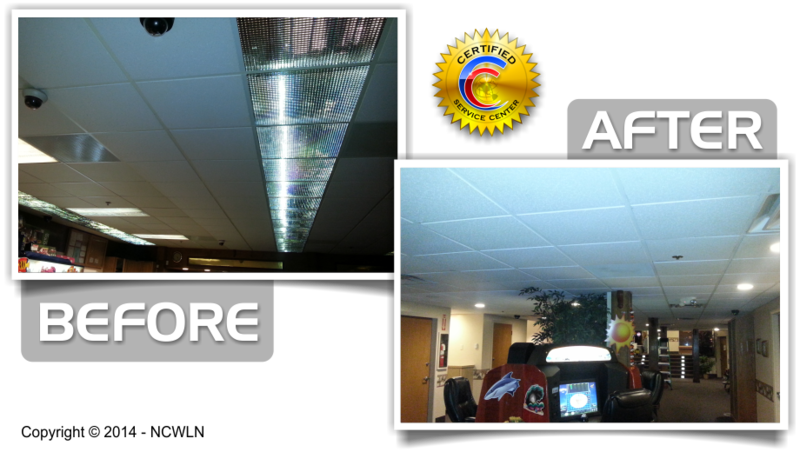 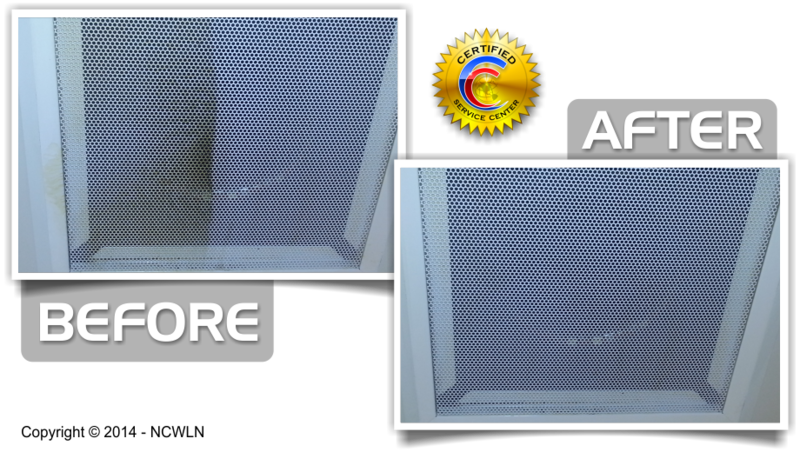 Here is a before and after picture of a Casino Ceilings, which was Revealed Edge and 9/16" Grid and Smoking. 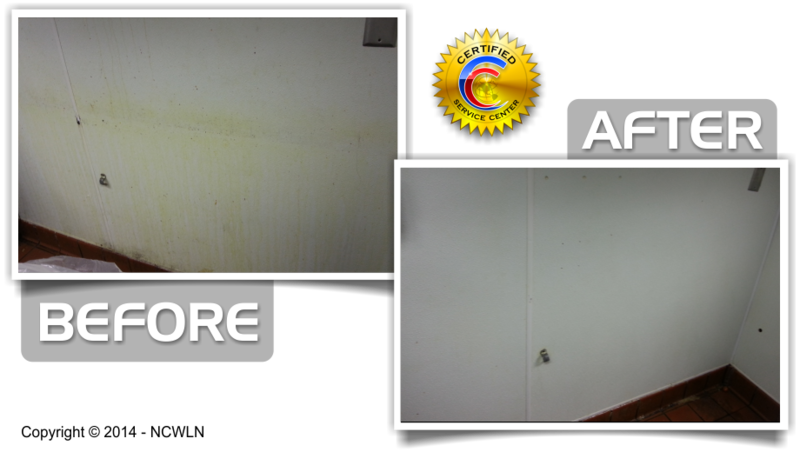 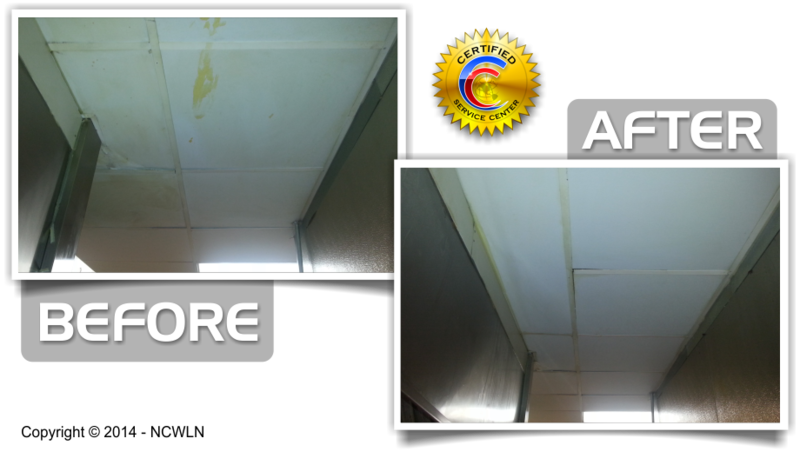 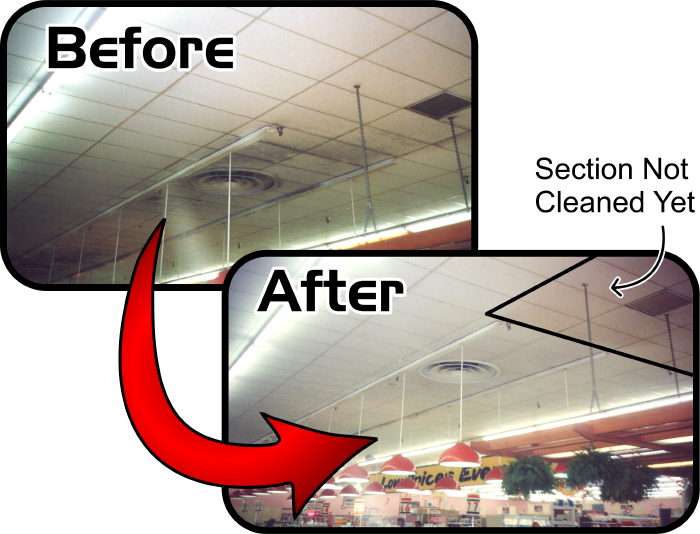 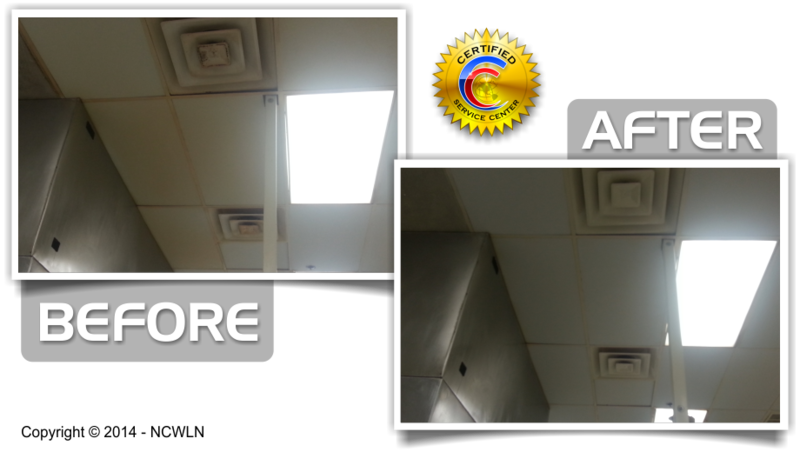 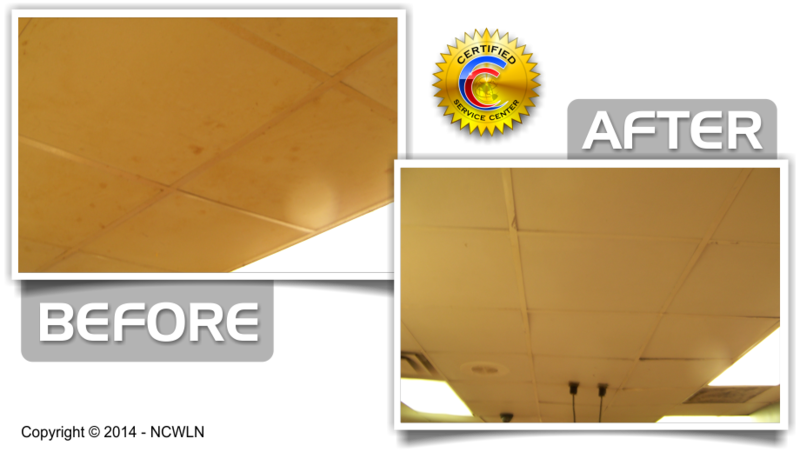 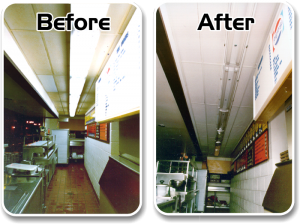 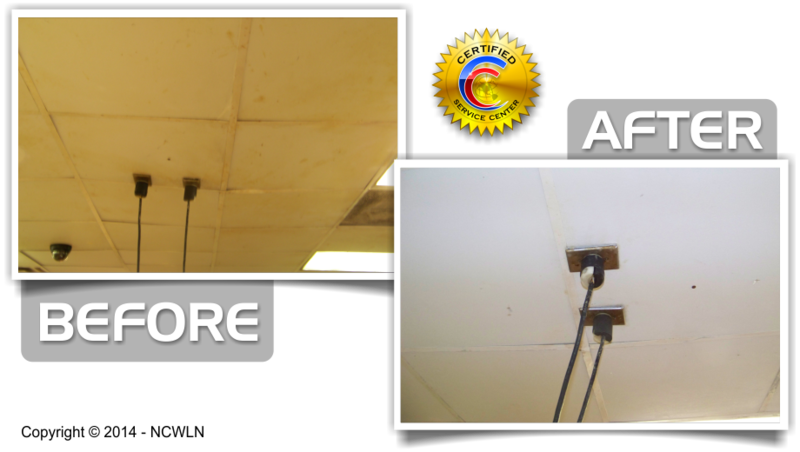 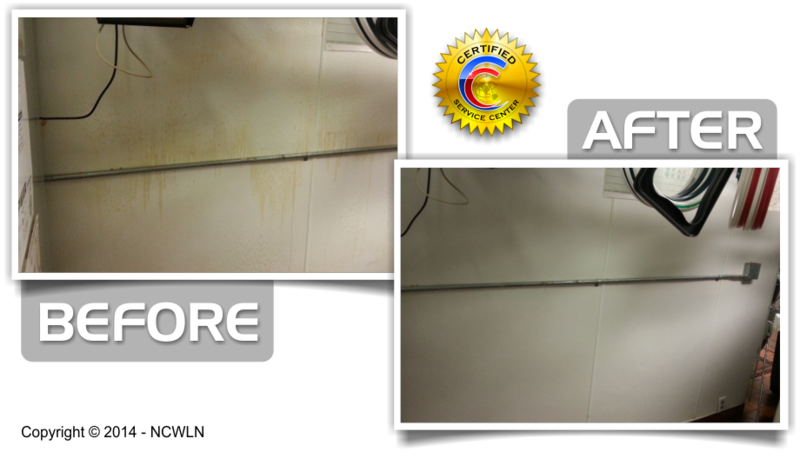 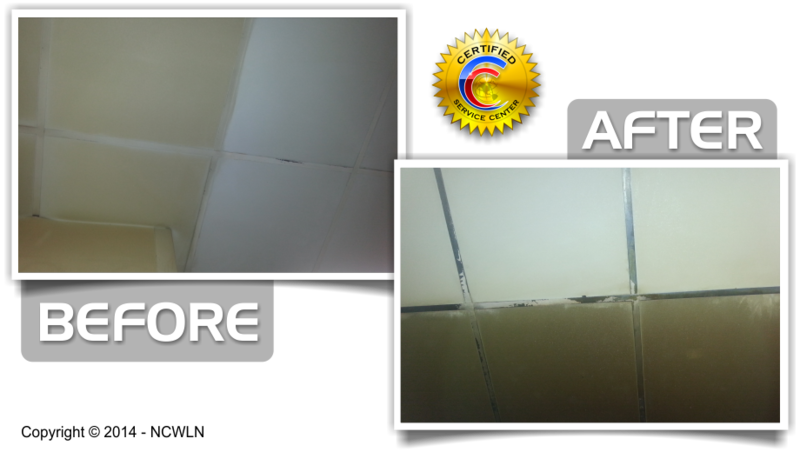 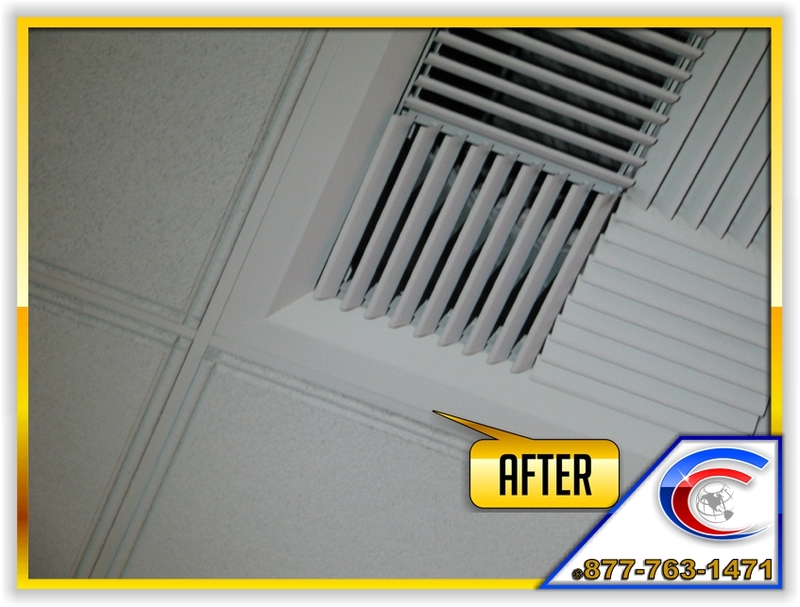 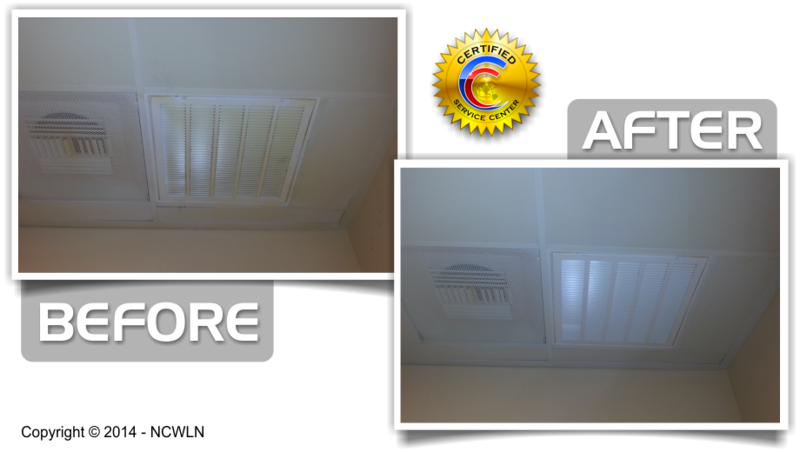 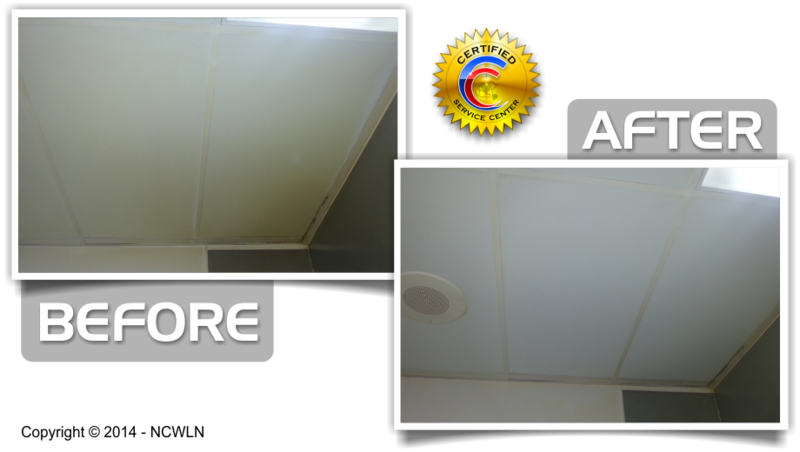 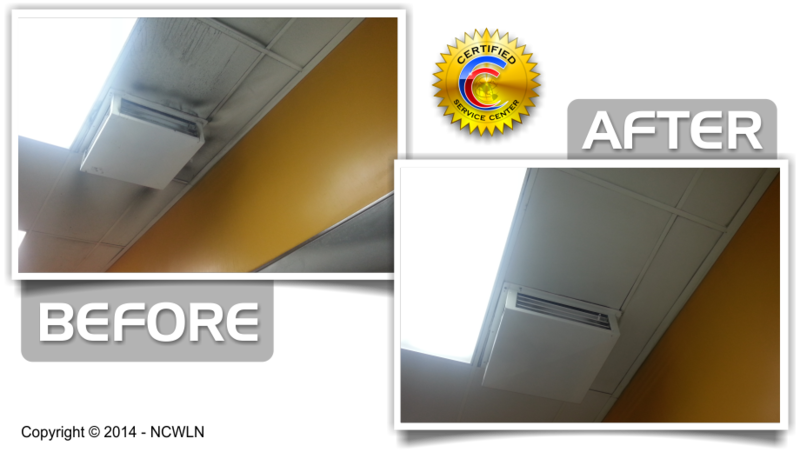 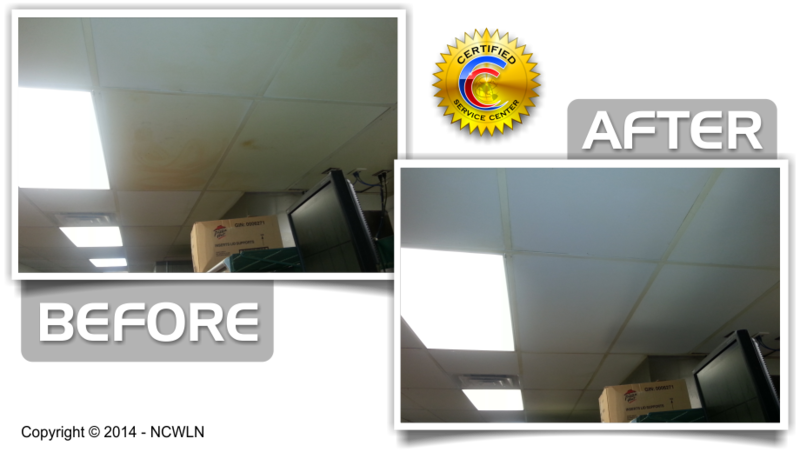 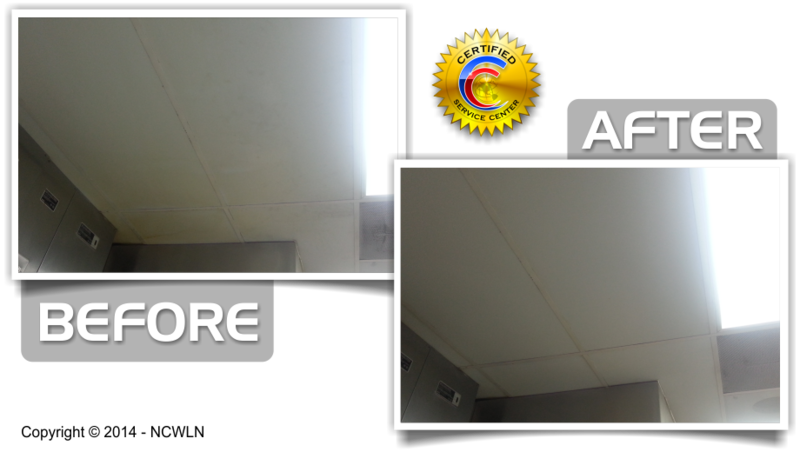 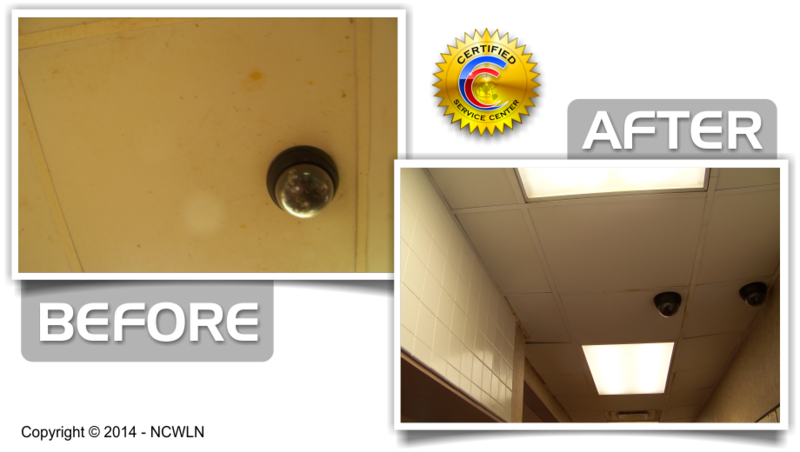 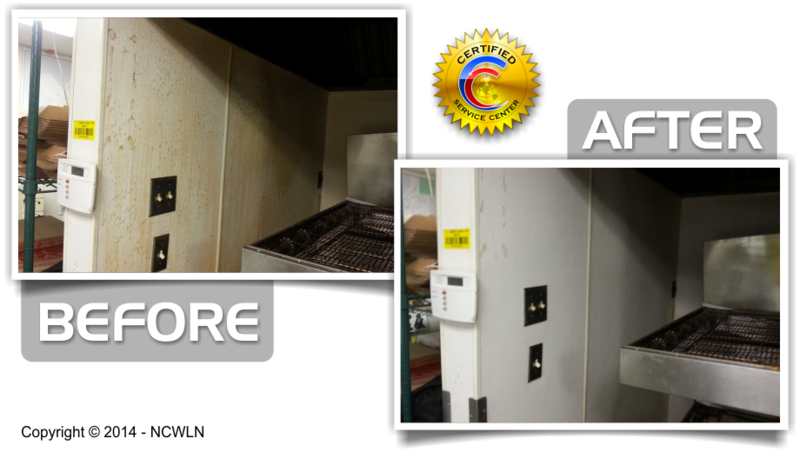 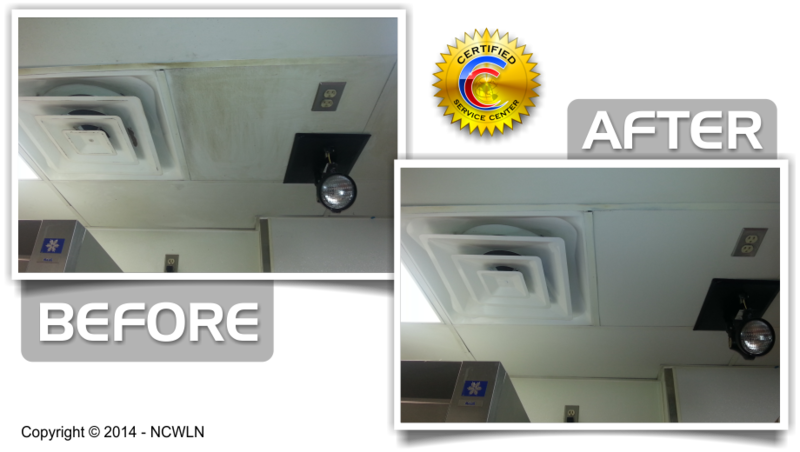 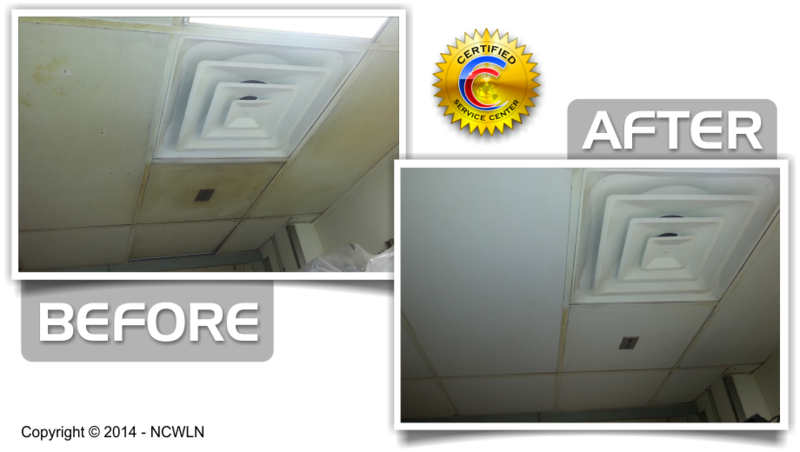 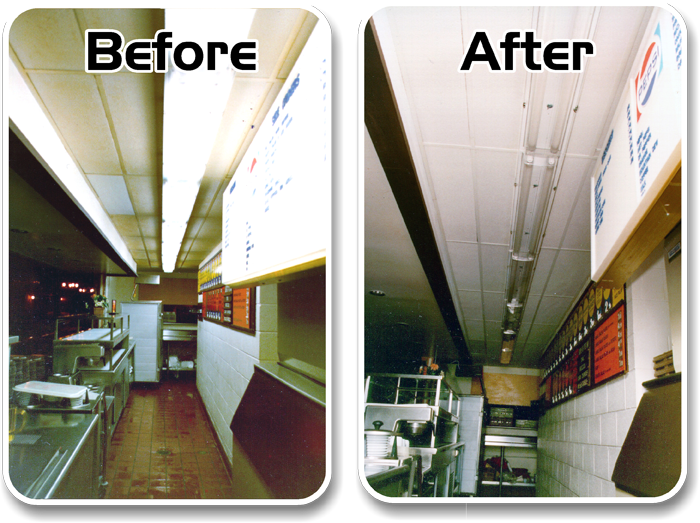 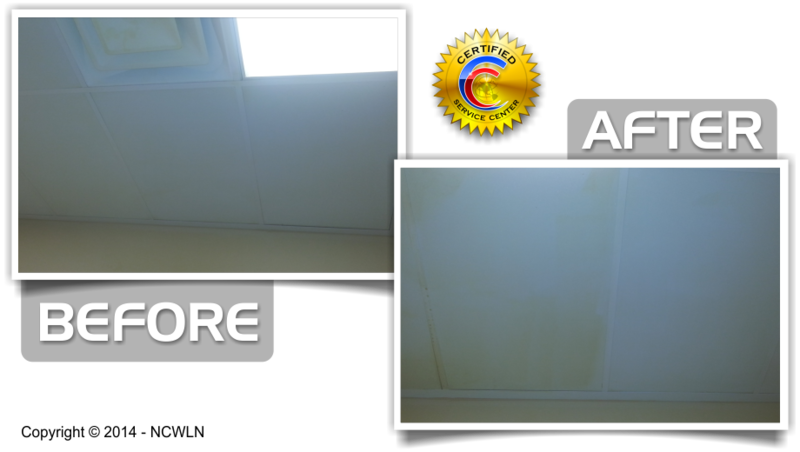 Here is a before and after picture of a Supermarket Ceiling that was Cleaned. 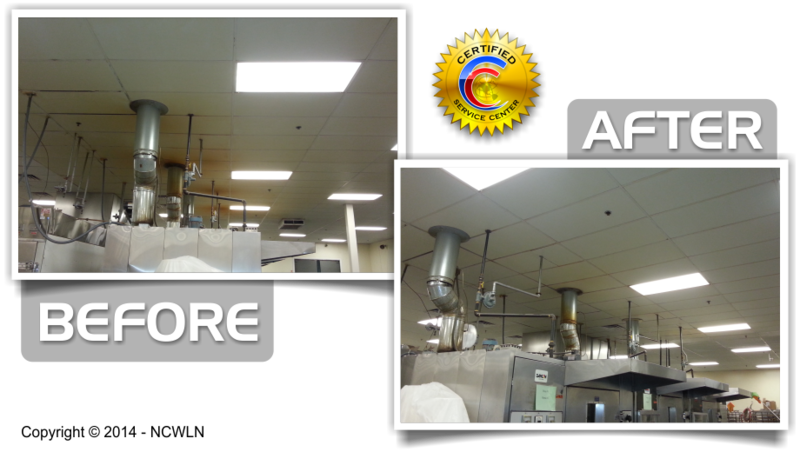 Check out the Difference! 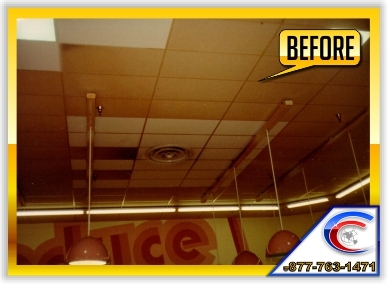 We clean Light Fixtures and Replace Water Damaged Ceiling Tile during the Cleaning and Remodeling Process. 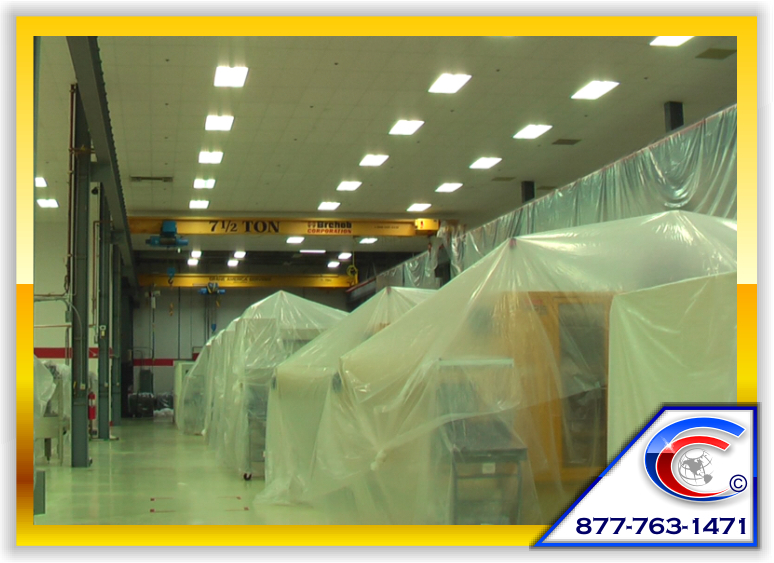 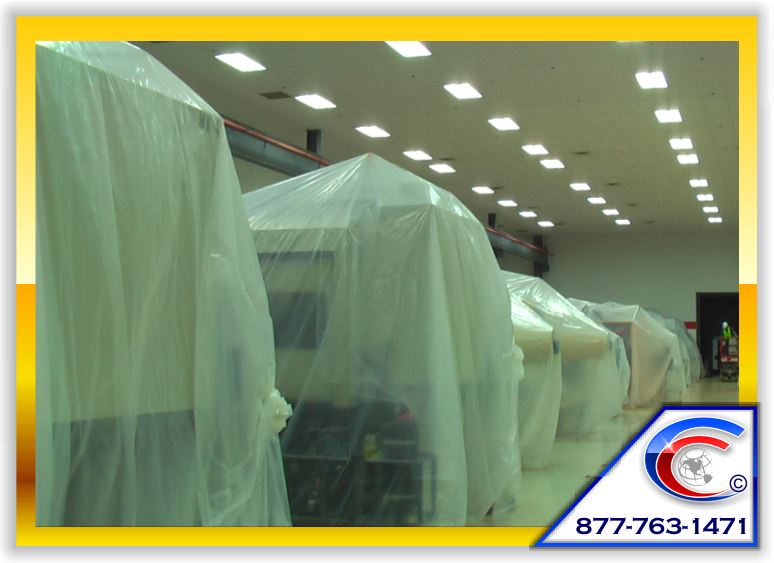 We protect the Investments of our Customers by Covering Everything. 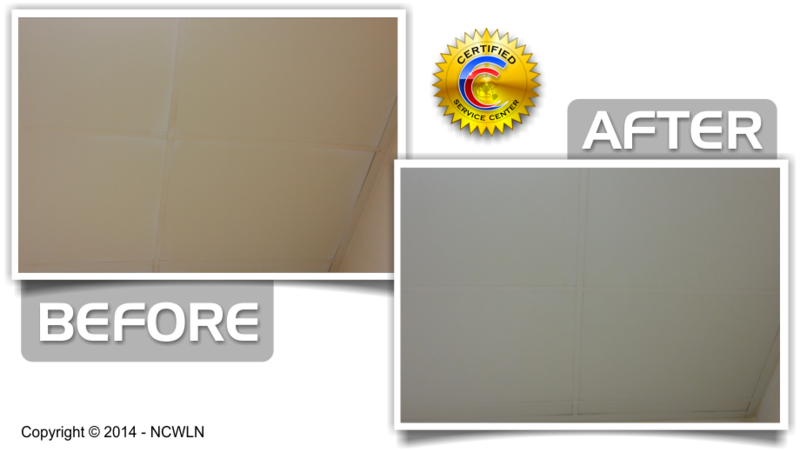 Our Specialist will Detail your Ceiling System by Polishing it as well. 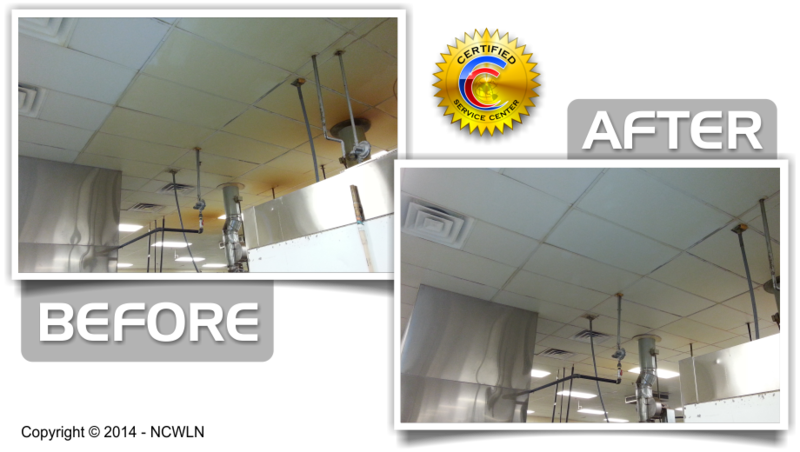 Specialty Cleaning Experts to handle even your toughest cleaning needs. 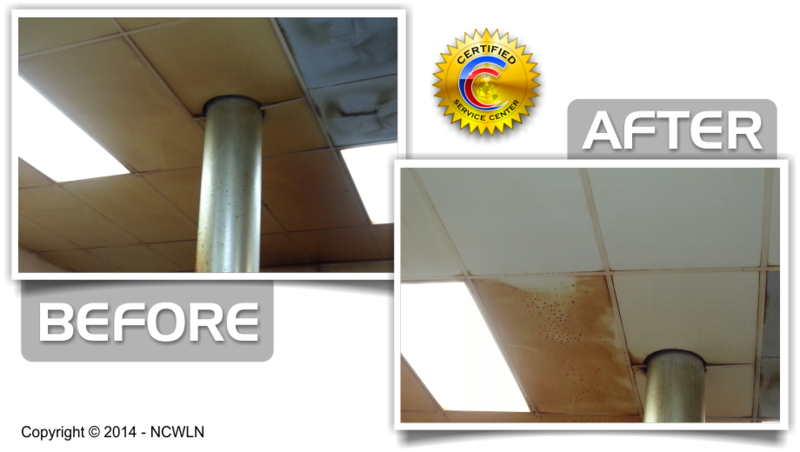 Our Exposed Structure Cleaning Solution is also great or cleaning; vinyl, wallpaper, toilets and urinals, tile and grout, carpet spots and stains, bathtubs, floors, glass, counter tops, non-porous ceiling tile, concrete, marble, stone, showers, upholstery, light fixtures and many other water safe surfaces. 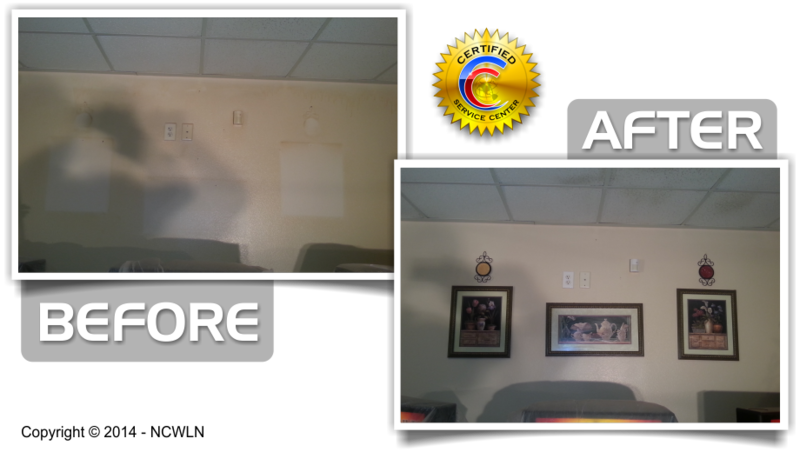 How is your mobile website, Don't have one, well you might want to get one according to Google.